The life of Gene Autry was not only entertaining, but also complex with military service, business holdings, and philanthropy. 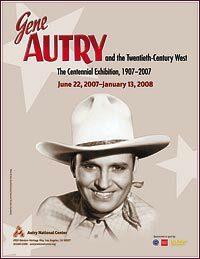 To understand how America's Favorite Singing Cowboy relates to the Twentieth Century West, the museum he founded had an in-depth exhibit on Gene Autry in 2007. Gene Autry achieved fame as America's Favorite Singing Cowboy, but he was so much more than that. The exhibit invited patrons to come learn about this multifaceted man who was the first and only entertainer to earn five stars on the Hollywood Walk of Fame for recording, radio, motion picture, television, and live performance. Gene Autry and the Twentieth-Century West: The Centennial Exhibition, 1907-2007 provided a comprehensive window into Gene Autry as a celebrity, innovative media maverick, sports team owner, businessman, and humanitarian. On display in the George Montgomery Gallery from June 22, 2007, through January 13, 2008, the exhibition spotlighted Gene's contributions during the significant events of his lifetime, including his military service during World War II, friendships formed with U.S. presidents, and his involvement in Major League Baseball. At every critical point throughout the twentieth century, Gene Autry was there-as a patriot, celebrity, visionary, and everyday hero who helped shape and influence our culture. As patrons toured the five-gallery exhibition, they engaged with fun, interactive, multimedia displays that allow them to sample early recordings and film clips. Patrons also experienced the more personal side of Gene as they peruse his closet full of brilliantly embroidered Western shirts, handsome, hand-tooled leather boots, and spotless cowboy hats, not to mention his famous Martin D-45 guitar. Additional displays rounded out the other dimensions of Gene, effectively bringing this legend to life for all to experience anew.